As part of the 76th annual National 4-H Week, the University of Nevada Cooperative Extension 4-H Program is playing host to 4-H National Youth Science Day events throughout the month at several locations across the state. Marie Markovich, Cooperative Extension Jim Barcellos, with Cooperative Extension’s 4-H Youth Development Program in Carson City, helps a boy with this year’s 4-H National Science Day challenge, Code Your World. This year’s challenge, called Code Your World, will teach kids a wide variety of skills that will enable them to apply computer science to the world around them. More than 100,000 4-H youth leaders across the country will be leading other youth in the activity, making it the nation’s largest youth-led STEM (Science, Technology, Engineering and Math) challenge. 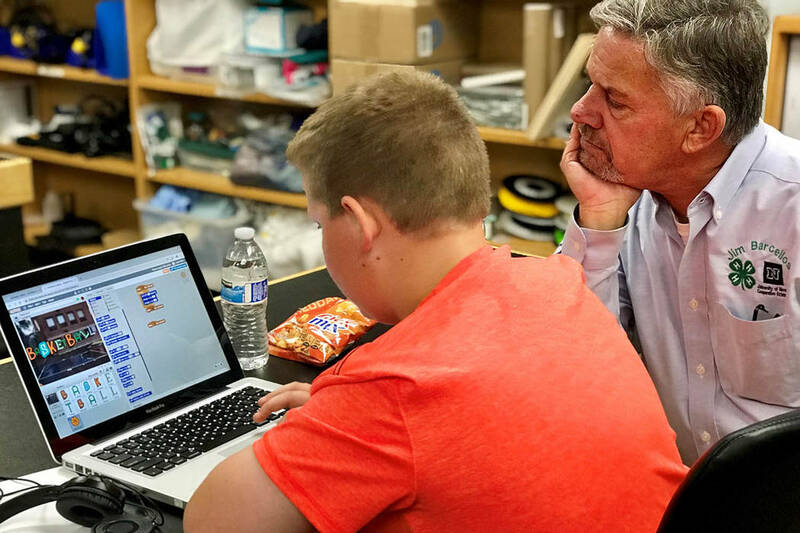 This hands-on experience, co-developed by Google and West Virginia University Extension Service, includes a computer-based activity on Google’s CS First platform, as well as three unplugged activities that bring coding to life through games and interaction. This year’s theme for National 4-H Week is Inspire Kids to Do. Throughout the country, 4-H clubs will provide youth more opportunities to do hands-on activities, empowering them with the skills they need to succeed in life and careers. 4-H was founded on the belief that when kids are empowered to pursue their passions and chart their own course, their unique skills grow and take shape, helping them to become true leaders in their lives, careers and communities. Research has shown that young people in 4-H are nearly four times as likely to contribute to their communities and are twice as likely to engage in STEM programs during after-school time. To find out more about local activities celebrating National 4-H Week and 4-H National Youth Science Day, residents are being told to contact their county’s University of Nevada Cooperative Extension office. For office locations and phone numbers, go to www.unce.unr.edu or call 775-784-7070. Details on the Pahrump Southern Nye County 4-H are available on the group’s Facebook page, which includes a calendar of events.